GAINESVILLE, FLORIDA — The 10th North American Paleontological Convention here is sponsored by the Florida Museum of Natural History. (The meeting is excellent, by the way, and very well organized. Congratulations to the paleontological team that put it together.) 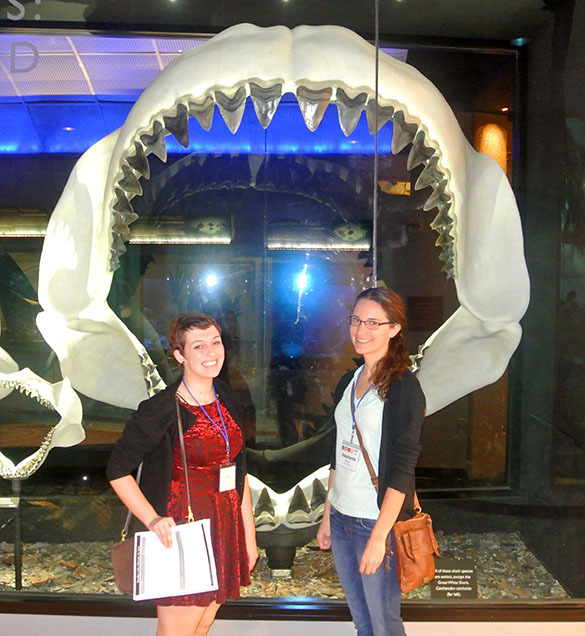 Since the public display halls of the museum are just across the street from the convention center, Steph Bosch (’14), Lizzie Reinthal (’14) and I gave it a visit. You can’t go wrong with a natural history museum, but this one was extra fun and informative. The first section of the museum we explored was the Hall of Florida Fossils. For a state with what I thought was a limited set of rocky outcrops and geological units, the range of Florida fossils is extraordinary. They are displayed here from microfossils (shown as magnified models) to large mammal skeletons. 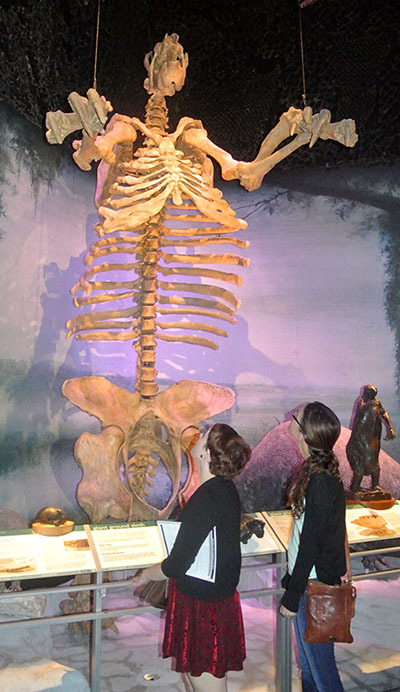 Steph and Lizzie are shown above looking up at a gynormous ground sloth skeleton from the Pleistocene. A star of the Florida fossil exhibit is a reconstructed set of jaws from the giant Neogene shark Carcharodon megalodon. It has hundreds of original teeth in several rows. I’m sure this photo setting has been used thousands of times by now. 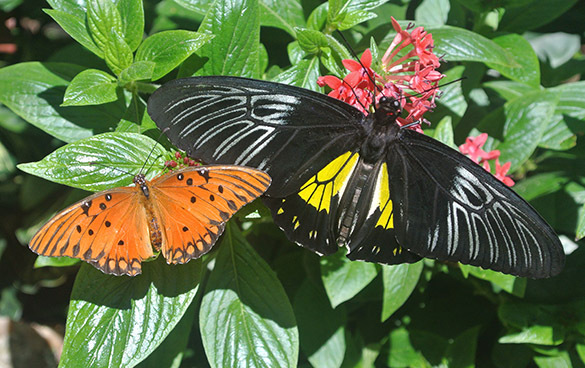 Just before you enter the enclosure there is a nursery for rearing butterflies, from caterpillar to chrysalis to newly-emerged adult. 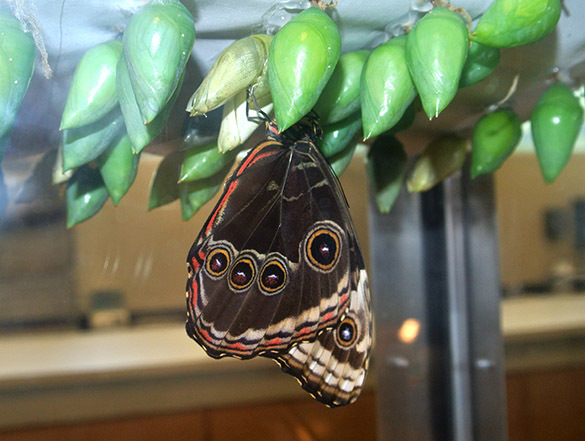 Above is a specimen of Morpho peleides (Common or Blue Morpho) still clinging to the husk of its chrysalis. Several siblings wait for their unveiling. After we entered the enclosure, I opened an outdoor guidebook to identify the butterflies. 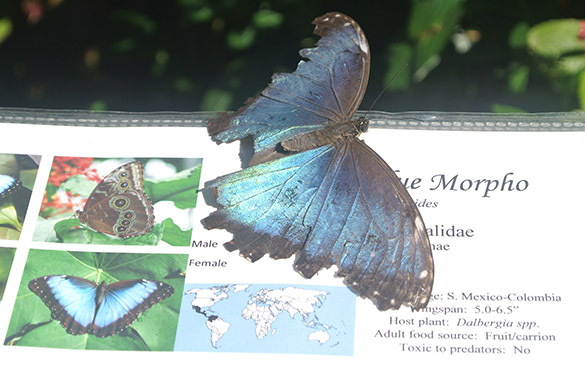 Maybe it was just chance, or maybe the attraction of the photograph, but a rather worn Morpho peleides landed right on its species description. 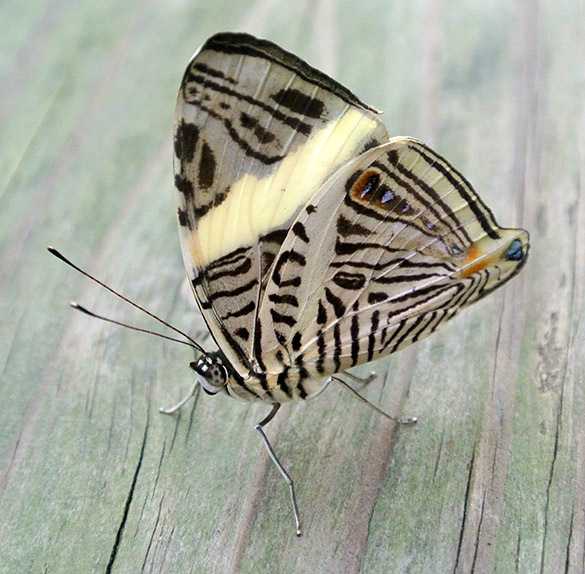 I could not identify the other butterflies I photographed, but that won’t stop me from showing a couple more images. I like the geometric patterns on the wings of this species. 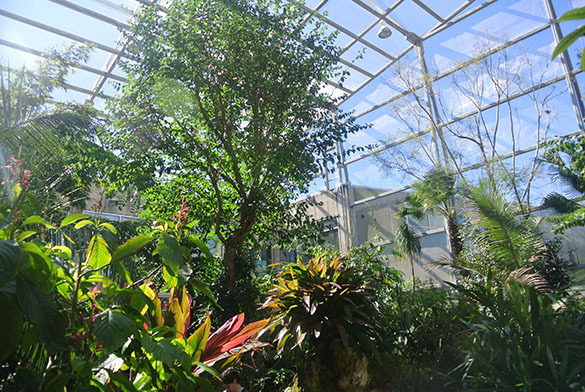 There is much more at the Florida Museum of Natural History than we could see in our brief time there. We highly recommend if you’re in Gainesville that you visit this wonderful, friendly, enriching complex.